Young Identity (YI) is an organisation dedicated to giving space to eager young writers from all around Manchester. I was able to chat to Kayleigh Jayshree Hicks to find out exactly what the group are about, and how to get involved. Firstly, visiting their website, they have one of the coolest promo videos for a society I’ve ever seen, which you should definitely check out if you like well-shot compilation videos. The group is made up of a diverse cast of people from all across the city and, as the ages range from 13-25, you get more of a variety of perspectives than at a regular university society. The organisation deliver spoken word and poetry workshops in well know venues HOME and Contact Theatre, as well as in more further out locations across the Greater Manchester area. Kayleigh was able to tell me what one might expect from one of these workshops. They usually start with a freewrite, which is a warm up writing session where you do not lift your pen from the page and write whatever comes to your mind. Then, they usually have an introductory discussion of a theme chosen for that particular workshop (an example Kayleigh gave me was Damani Dennisur’s happiness workshop) and the group debates their ideas about this subject. They then go into the main task of the evening which is around half an hour’s worth of writing, and finish by sharing some of their work with each other. To my surprise, she said that new timers always share! With Young Identity being placed so centrally in a city like Manchester, they have had many opportunities to work with some big names in the industry, including Lemn Sissay, international spoken word icon Saul Williams, dub poetry legend Linton Kwesi Johnson, Ted Hughes Prize Winner Kate Tempest, and the late Amiri Baraka. Working with these industry giants allows the group to have a real taste of what it takes to create work that can inspire consumers, but also a real sense of possibility. Having the opportunity to meet and work with people who have successful, published art is truly inspiring and gives young people the confidence and the belief in themselves to put pen to paper. The blank page can be one of the most terrifying things, as anyone who has ever sat down to write poetry will know, but to have inspiring people encouraging young writers is invaluable to their confidence and their work. They have enjoyed a lot of success in recent years, including being featured in the Manchester International Festival as part on FlexN, which is a dance style joining local dancers and the poetry collective to explore different ways of storytelling. YI have performed all over the UK, from BoxedIn in London to Hay Festival in Herefordshire as well as internationally at Frankfurt Youth Poetry Slam in Germany to America’s Nuyorican Poetry Café. As Young Identity gives their contributors so much opportunity to perform their work, I asked Kayleigh about her experience on stage. She replied that it’s different for everyone. “I suffer from stage fright and anxiety so every time I go on stage I am s*itting bricks. However, hearing people connect with your work, making new friends and having fun without social pressure of drink or drugs makes it worth it.” Kayleigh also runs an open mic which has branched out from the Creative Writing Society, called ‘TOO SHY? OPEN MIC!’, which is based in Northern Quarter coffee shop, Chapter One. The December event is full up with early birds but head on down to show your support if you can, and they may have a few spaces on the night for brave newcomers. 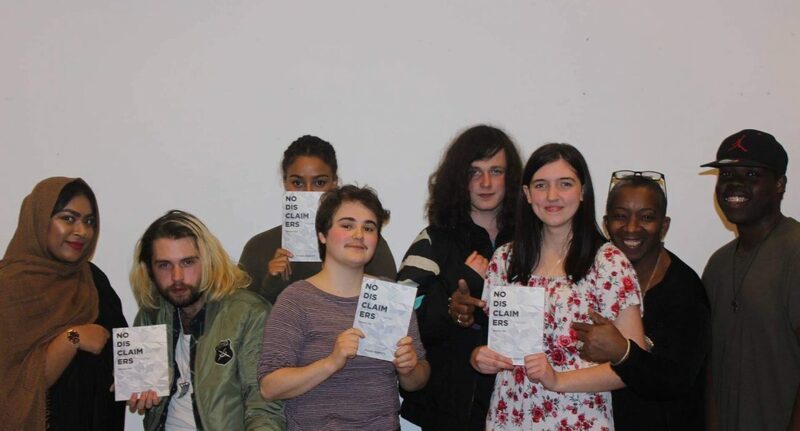 Excitingly, they have announced the publication of their latest anthology, ‘No Disclaimers’, set for release on the 6th of December Kayleigh remarked that compiling the anthology was stressful at first, with everyone working on it together whilst working and studying. They really had to pull their socks up and communicate effectively, edit with care, and be supportive. She says her favourite memory of creating the anthology was sitting down with her good friend Joel, editing, which involved eating some home made bread, with his animals sat nearby. The anthology includes short stories, poetry about taps, advice on life, metapoetry, and the most emotionally charged, technically skilled writing Manchester’s underground scene has to offer. If you want to get involved with Young Identity, they have a workshop on Monday 3rd December from 7pm – 9pm at HOME theatre, and another on Tuesday 4th at Powerhouse Library from 7pm – 9pm. Make sure you pick up a copy of their new anthology ‘No Disclaimers’ on the 6th of December.